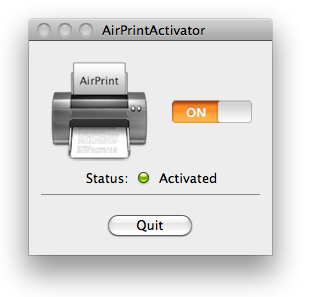 A few people have reported issues running the AppleScript version of AirPrint Activator. I took upon myself to learn Objective-C and convert my AppleScript based application into a pure Objective-C. It was not easy but I think I made it! Some suggested I should add a donation window to the application as some reported that it literally saved them from buying a new printer and wanted to donate a few $. I have added an option to donate if one wish to the application. Please let me know if you run into issues with it. I hope it will be more stable than the AppleScript based version 1.0. As always, you can download it from the main application page.